In older versions of Outlook, you could right click on a contact and choose "New Appointment with contact" to create an appointment linked to the contact. This command was removed from Outlook 2007 and up but you can still create an appointment with a contact using the Meeting with contact command then canceling the meeting. In Outlook 2010, select the contact(s) and either click Meeting in the Communicate chunk or right click and choose Create, Meeting. In Outlook 2007, select the contact and right click and choose Create, Meeting. To create a meeting with multiple contacts, go to Actions > Create > New meeting request with contact. 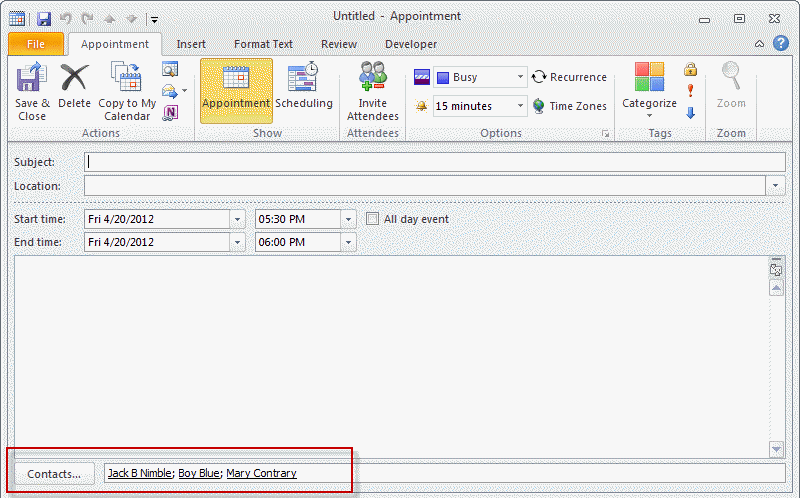 After the meeting form opens, click the Cancel Invitation button to drop back to an appointment form. If you have the Contact linking field visible, you'll see the contacts are linked to the item. While it is not necessary to show the contact linking field (the contacts are linked regardless) you can enable it in File, Options, Contacts, Show Contacts linked to the current item if you are using Outlook 2010 or newer, or Tools, Options, Contact options in Outlook 2007. Sorry, I didn't read your entire article before responding in my previous post and failed to ask if there is a way to pre-populate the subject and location fields without coding (VBscript or VBA)? It's all well and good that the appointment is linked, but the real reason I would want to create an appointment from a contact is so the contact's name appears in the subject line and their address appears in the location field of the appt. Or are programmer's that myopic that they don't know how people really use contacts and appointments? Outlook has an incredibly rich data "linking" environment built into it and yet so often they don't avail themselves to use it in these very obvious and useful situations. I guess the developers think everyone is intent on wearing out their keyboard by typing everything over, and over, and over again! Why do the programmers at Microsoft insist on degrading so many features of their software products? Time and time again, I see features removed, like this one, or "improved" so it's harder to use, made less effective, takes longer to do, made more frustrating, etc., etc. The programmers need to get their heads out of their respective butts and really look at what they're doing!